The chicks arrived safe and sound yesterday morning. We received our phone call from the post office at 6:30 am. Jason took off after them. He and Aunt Debbie unpacked all 400 chicks & 50 guineas and dipped their beaks into water. You do this to teach them how to drink and also show them where their water source is. Theses chicks just hatched 2 days ago this was their first drink of water and bite of food. They will stay in our brooder house until they are a bit older. The chicks will need to be able to tolerate the weather temperature and little better before we can release them. These are Cornish Rock X and Red Broilers. They are strictly meat birds (broilers). Just to give you an idea of how quickly chickens change, here is the first batch of our egg layers that we received in April. 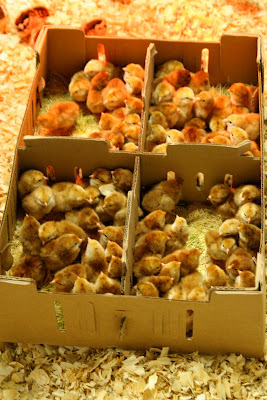 These are the chicks that pictured below in the cute little boxes. They are out on pasture and beginning to lay beautifully. Its amazing to see them change from baby chicks to beautiful hens (and a few roosters). Its amazing how quickly life can become crazy. In our case- this happened with just one phone call this morning. Farmer Jason went from driving around the pastures collecting soil samples to now preparing for 400 chicks (and 50 guineas) to arrive in the morning! Aunt Debbie and I had big plans of putting up a picket fence around our store and new landscaping (darn goats). But, as life on a farm goes, we must shift gears and lend a hand. The chicks weren't due until next week so we weren't planning on getting ready for them until a few days before they were scheduled to arrive. They will arrive at the crack of dawn at the post office in the morning. We will go pick up the chicks packed neatly in cute little boxes and turn them loose into our brooder house. These chicks are Cornish Rock crosses and Red Broilers. The purpose of these birds will be strictly for meat. They will be ready for butchering in 8-10 weeks. I'm so excited to finally have our very own pastured poultry. We will process (butcher) these chickens ourselves on our farm. 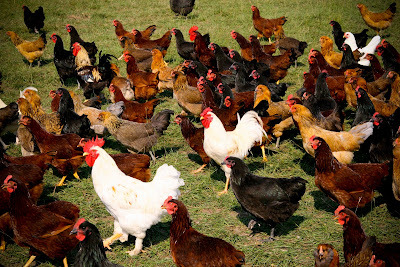 In the state of Texas, you are allowed to process up to 10,000 birds on farm as long as you sell them directly off your farm or at farmer's markets. Jason says we will butcher 9,999. We shall see. Either way, "there a comin' ". This commercial showed up on television the other day. I don't know if its been around a while since we don't watch much television, but I found it extremely interesting and aggravating all at the same time. Along with this commercial coming on scene, this website (HFCS Facts) and this website (Sweet Surprise) have also popped up. There is so much information out there about high fructose corn syrup (HFCS) being bad for you. And make no mistake about it, it is. But, simply hearing its bad for you and being an instant HFCS-Nazi is not a good idea. You then risk looking like the woman in this commercial. Know the facts behind the decisions you make. The claim that HFCS is a 'natural' ingredient is far from the truth. That in and of itself is deceitful. HFCS is made up of almost all genetically modified chemicals and is most definitely made using genetically modified corn (GMO corn). GMO corn was created in the early 90s. It was was man's attempt at creating a product resistant to pesticides and herbicides that their fields are saturated with. Farmers can drench their fields with pesticides and herbicides and the corn plants remain unaffected. Insects won't even eat GMO corn as it was developed to be insect tolerant. The name of the seed used in the majority of GMO corn is 'Round-Up Ready Corn'. If something has a corn product (Corn Syrup, HFCS, Cornmeal, or just plain corn) in it of any kind and is not certified organic, you can know without a doubt that product was made with GMO corn. The vast majority of the country's meat within the traditional meat industry is fed GMO corn (yet, another reason to eat grass-fed meats). A good summary of the HFCS and corn crisis is the movie KING CORN. This movie is highly entertaining and informational as well. There are overwhelming statistics that are in this film. The guys who made this independent film even attempted to make HFCS in their own kitchen. It was a bit scary watching what they put in this stuff. My all-time favorite quote from the movie is from a corn farmer in Iowa. He states proudly in the movie,"We're not growing corn. We're growing crap." There is a vast amount of information out there about GMO corn and the other genetically modified foods that our government allows. I could type forever and not even cover the surface of this. Corn is an important issue. Its in everything it seems like. I could not even find a bag of hamburger buns at the grocery store without HFCS in it. Here is a brief list of the GMO foods allowed by our government, but know that within each of these categories are several varieties of GMO seeds. If there was an ingredient I'd choose to omit from my diet, it would be anything containing GMO corn products. There is some disturbing info about this stuff. A better option would be to buy organic corn products. Most of the packages say "Made with non-GMO corn". I hope this doesn't come off too critical and harsh. My heart is to educate and encourage others to educate themselves so conversations like in the commercial don't happen. I get so aggravated when I see commercials and websites like the one above as if Americans are silly enough to sit back and believe whatever is put right in front of them. But, don't just take my word for it or believe these commercials and website. If its a concern of yours, I encourage you to look into it and dig a little deeper and read labels. I am a product junkie. What I mean by this is that I love to try new products in hopes I will find the perfect one I've been looking for all along. And once I find the perfect product, I like to stick with it. This makes my life much easier. Unless I find something even better, in which case, I now have a new favorite product. Consider this post a review of sorts- a review of all-natural beauty products with good ingredients. If you can wear it, bathe with it, scrub with it, or brush with it, you bet I've tried at least 20 different varieties of it. I would like to step up on my soap box for just a second. You must be careful when you buy a product that is labeled 'All-Natural' or 'Organic Ingredients'. Although your intentions may be good, I have seriously felt cheated on more than a few occasions when I actually found out what was in a product that I purchased. Just because it says this, doesn't make it so. Sprite says 'All-Natural' on the label. Its a good idea to be educated on the ingredients to steer clear of. There are several products out on the market now that aren't entirely what they say. Since the buzz words that are mentioned above are now all over the place, companies are taking advantage of uninformed well-meaning customers. Okay, I'm stepping down from my box. Let's start with deodorant. You better believe that Jason and I have tried almost every natural deodorant out there. We've even tried a few homemade essential oil combinations. Alvera Deodorant is BY FAR the best that we've found. Its works awesome for both of us and the Almond & Aloe scent is lovely. Now, we still perspire a little bit since this is a natural function of the body. But, we most definitely never smell. I can't say the same thing for other natural deodorants that are out there. I've tried at least a dozen to find the right one for us. I even buy this deodorant for one of Jason's fellow fire fighters because he loves it so much. This deodorant has Grapefruit Seed Extract, Witch Hazel, Aloe Vera, Oat Protein, Herb Water, and a few other ingredients. Its worth trying out. I purchased this initially at the HEB in College Station, but have since found an online store for me to buy from that will be listed below as well. This has been a sore subject for me for a while. Mostly because I would LOVE to not wear any make-up. But, as hormones would have it, this simply cannot be the case for me. It AIN'T pretty people. I know that wearing make-up in and of itself isn't even considered 'natural' to some out there, but I just knew I could find a good make-up for my skin and still feel perfectly confident. I have heard of mineral make-up for a long time, but never fully understood the benefits of it. The biggest thing with mineral make-up is that is contains no chemicals and the minerals are actually good for you skin. I've struggled with skin problems my whole life so this was a huge factor for me. I looked up make-up with the lowest toxin rating in the COSMETIC SAFETY DATABASE (skin deep) and came across Everyday Minerals. I was looking for an inexpensive, neatly packaged, user friendly mineral make-up and found this company. The added bonus was that it was in Austin, TX!!! Local and non-toxic- two thumbs up from me! I bought the mini-sampler kit for $18 and received 6 different varieties of make-up including eye shadow, bronzer, foundations, concealer, etc. This kit lasted me 1 1/2 months and I wear make-up mostly every single day. I was a little apprehensive about the coverage since this is a big factor for my problem skin. But, I was more than pleased with the coverage. You can apply the desired covered you want and not feel like you are wearing a pound of make-up. I bought a different brand of make-up every single time I ran out of my 'whatever'. But, after using Everyday Minerals, I won't by anything else. I ran out not too long ago and I could tell the difference in my skin when I had to go and buy something from the store to get me through. The label creeps me out, but I have fallen in love with the Dr. Bronner's Magic Soaps. They are pure castile soaps and can be used all over. The directions say that this can even be used as a mouthwash. I proved this concept to be false after one swish of this stuff in mouth. It was the most terrible taste I've ever experienced. I also love Dr. Bronner's soaps because we can wash with it and I can use it to make my homemade cleaning products so it serves as a dual purpose. Jason loves the Almond scent and has to be in mood for the Peppermint. The Peppermint makes you tingle. I'm not even kidding. You should try it. Its refreshing! As for the website I mentioned above, I love Vitacost.com. The thing to know is that not everything that you can buy on this site is considered 'natural'. But, they have tons of varieties of products and they have AMAZING prices and shipping. I have been really pleased with them. The other thing I love about this site is it gives reviews of the products from customers so that is very helpful. Especially if you are a product junkie like me. I'm still on my quest for naturally wonderful products. I will keep you posted as I discover them. But, in the meantime, what are some of your favorite products? I'm still on the hunt for a good shampoo & conditioner. That's all we lost on the farm when Ike made its way through here last night. The two trees were already somewhat dead and the 4 chickens weren't smart enough to get out of the rain. Although, Farmer Jason and I spent about 1 hour chasing these 4 geniuses down and putting them in the barn several times last night before the storm hit. Kaylyn would tell you that our yard looks 'junkie'. That is what she said when she looked out of the window this morning. There are lots of parts and pieces of trees everywhere. But, we are thankful as it could have been much worse. I found out something new about myself. When disaster strikes, I'm a cleaner. Some people handle their stress in different ways by being cookers, crafters, eaters, etc. Well, I'm a cleaner. I organized the girls entire closet among other various procrastination areas before the storm hit yesterday. This worked out well on the farm because Aunt Debbie is a cooker. She loves to cook. So we were well-fed and I had a clean house. Perfect! Please keep Jason in your prayers. He went into the fire station in Houston this afternoon. He said Houston was destroyed in many places. They transferred his crew to a different station with a working generator. A lot of the calls they are getting are for fires. But, he said it was indescribable what it looks like around there. Most people are packing up and leaving because they know they face days without power. Please keep everyone affected by the hurricane in your prayers too. I see beautiful things happen within the church during a crisis like this. I know there are churches all over that will be taking care of evacuees as a form of 'worship' Sunday morning instead of having a 'normal' church service. Pray that the Lord is glorified in those places and the evacuees sense an overwhelming feeling of peace and comfort. As you've probably heard by now, Ike is due to hit the coast of Texas beginning tomorrow evening and continuing through Saturday. Ike is huge in size! I'd love to post a ton right now, but we are busy little bees around here gearing up for the storm. You see, our farm is located about 1.5 hours northwest of Houston. They think the eye of the hurricane will even pass through these parts so we are preparing for the worst. What does one do with a herd of cattle, pigs, a gazillion chickens, goats, some cats, and a rowdy dog named 'Rowdy' do when a huge hurricane is headed for them???? But, we are preparing as best as we can and know how. Things are pretty crazy in our little town right now. Keep our farm and family in your prayers. Jason was scheduled to work Saturday with the Houston Fire Dept, but has paid a replacement so that he doesn't have to leave us here all by our lonesome. I'm so thankful he will be here! Also, pray for everyone down here in Texas in the path of the storm. I will update you as I can. I will leave you with photos of our newly remodeled barn. 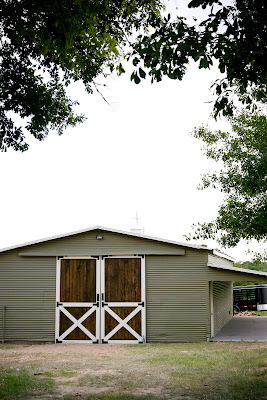 We had it painted our official farm green and some new glorious barn doors put on the front not only to keep all of the critters out, but also to spruce it up a bit. There is also a new concrete slab to the right of it under a porch. Our farm is super happy to announce that we have our website and online ordering system up and running. These are exciting times! We are trying to form a 'grass roots' effort of advertising in order to keep our advertising costs down and what better way to start than with the people we know. Please send the information about our website to anyone who may be interested in naturally raised meats. 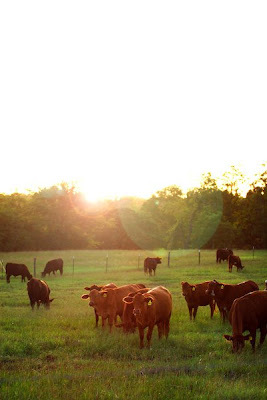 For those of you who don't know what we do, we live on a farm in Brenham, TX and raise pastured meats- grass-fed beef, pastured pork, free-range chicken & eggs. We have been in production phase and now we have product available. We have PORK in a variety of cuts available. And let me share with you that it's excellent (of course we sampled everything:)! The quality and taste are hands down amazing. We also continually have eggs and our egg production is increasing daily and will continue to go up throughout the fall and winter. Our farm is expecting beef to be available in the coming month. We are working on getting our walk-in freezer for storage to be able to have enough room to freeze our meats. 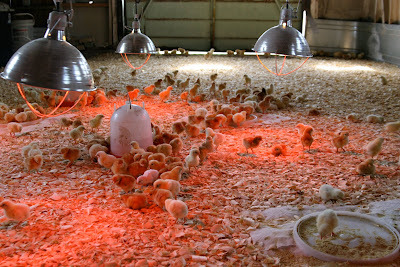 Also, we recently ordered 400 broiler chicks that will be ready for butchering hopefully the end of November. So, we will soon have whole chicken available too. There is plenty of information about our farm and products on our website. 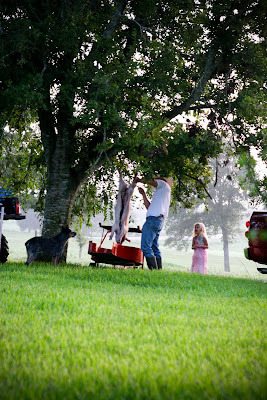 There is also a FARM BLOG built into the website so you can subscribe to that and stay updated on our farm happenings. 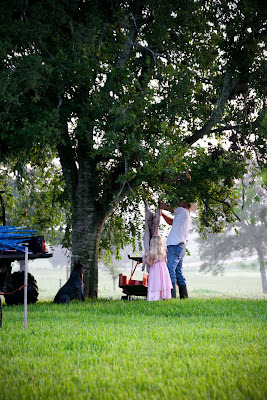 This BLOG (the one you are reading:) will continue to exist for our family stuff, but will also continue to have information about our farm as well. 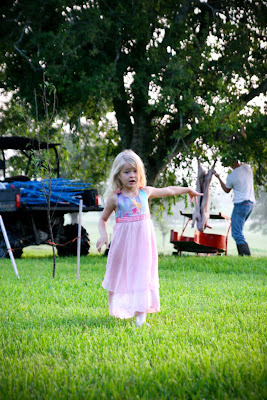 We couldn't have just a family blog or farm blog since the two go hand in hand. 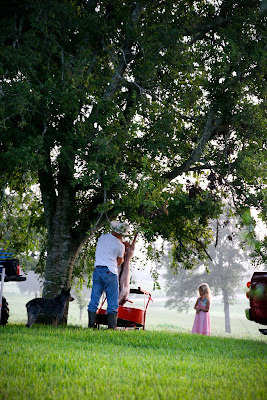 So much of what we do as a family involves the farm. Please go pay our website a visit and let us know what you think! For those of you interested in placing an order, you may do this on the website by selecting 'ORDER HERE' in the left margin and following the necessary steps. Thanks again for helping us get the word out. We appreciate your support. I was deeply touched by an older woman in bible study last night. This particular lady has one of the sweetest spirits that I've witnessed. She is in her early 80s, but still has a thirst and desire for the Lord. She is at our ladies bible study weekly eager to learn, but also able to offer encouragement and wisdom to some of the younger ladies such as myself. Last night, she asked for prayer. There has been a younger woman that has been a regular visitor in her home on a weekly basis. She finally gained the courage to ask this young woman if she had a church she was part of. To answer her question, the younger woman responded that she didn't and hasn't had a church before. The older woman left it alone at that point. She confessed to all the women present in bible study that night, that she had a deep desire to be able to share Christ with people and knows that its what we are called to do, but she has never been able to get to that point because she is overcome by fear. And she wasn't alright with that fear knowing that souls are at stake. She also acknowledged that no one comes to Christ by man's best efforts, but are drawn to Him by Himself (John 14:6). And she stated that there have been many times where she simply wasn't obedient in sharing Christ with others. This story is a little all too familiar for me as well. I sat there and listened to her care-worn voice echo what was in her heart. They were words of someone finishing this life well. Someone who was still desiring to please God in all she says and does. Someone, who although is very wise, still realizes that they have areas to grow in. Someone who wasn't done training for the race that she has yet to finish. I was so blessed by this. I was reminded, yet again, that we should be constantly growing- physically and spiritually. Physically growing or aging is inevitable and can't be stopped. It occurs naturally. But, our spiritual growth is different. According to scripture, we can stay infants purely on milk and not ready for substance (Hebrews 5:12), or we can grow up in our salvation (1 Peter 2:2). Our growth is directly related to how much we press into Him. We grow by trusting in Him, spending time with Him, learning about Him, and training for the race set before us (Hebrews 12:2). This may sound so simple. I love it when the Lord speaks simple truths over me. And although it may be simple to understand, its implementing and living it out that becomes the struggle. I pray that I am mindful of what I am training for and the race that I'm running. I pray that my actions reflect that I am in a race running with Him, for Him, and to Him. 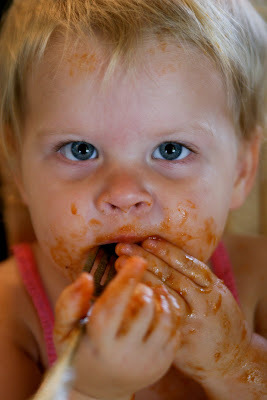 Below are some images of 'firsts' in our home this week. 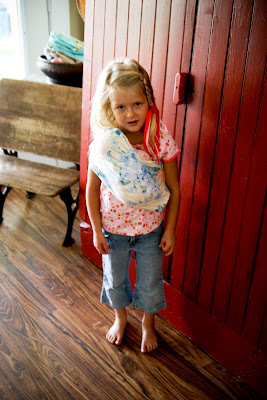 KK asked me if I would 'swaddle her baby to her body'. It was so cute. 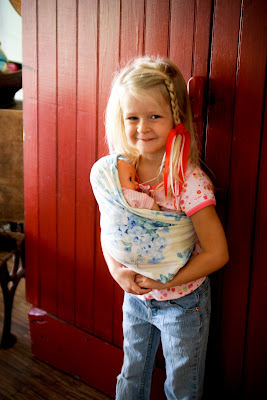 I wore Laney Rae in a sling constantly. 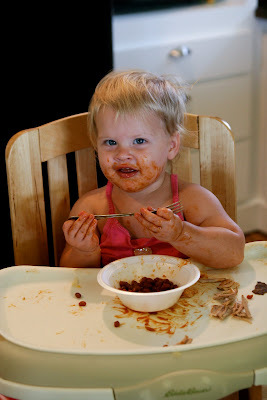 Laney Rae is learning how to eat with a fork. 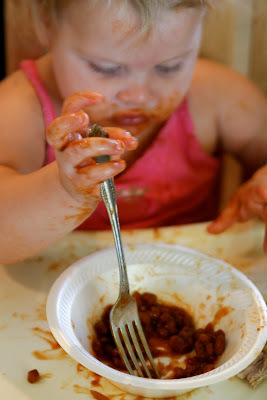 You might think I'm a terrible mom for giving my child a real fork and not those plastic baby ones, but she won't have anything to do with the plastic baby forks. Part two of Farm Life= Excitement continues. Although, its not near as action packed as the first part. One of little piglets that we've had since birth was not doing so well. He had lost his ability to walk with his back legs. As a result of this, the poor little guy prolapsed. Farmer Jason spared him the days ahead of suffering and put him out of his misery. I need to interject here by saying that we butchered this piglet for our own personal consumption (as in, Labor Day dinner- see photo below). The pork that we sell is butchered professionally and packaged in perfectly sealed retail cut bags. Nonetheless, they ALL taste incredible. You should give it a whirl. The events below transpired at insane hours of the morning last Friday. 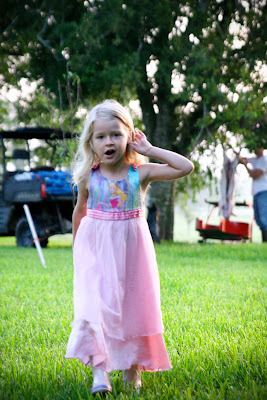 Shortly after waking up, KK realized that her daddy was nowhere in sight. "Where is daddy, mommy?" KK asked. "He is outside," I replied. "Well. Remember that sick pig? Daddy had to put him down this morning?" "How does he do that?" "He has to shoot him. Its what is better for him because he was hurting very badly." "Oh. Okay. Can I see him?" After she asked this question, I looked for Jason to see what stage he was at in the process. And I caught him in the 'pig hanging from tree' stage. KK quickly slipped on her rubber boots and bolted out the door. Jason said that KK was extremely interested in everything and never once acted as if she was grossed out by any of it. She did keep asking Jason why the pig's eyes were open. This was fascinating to her and lead to an entire train of questions. I'm sure there were lots of other funny things that she said and asked. This was her first butchering experience. I grabbed the camera because I seriously thought this was a strange event KK was participating in before school in her princess pajamas. I just sipped my coffee and snapped some photos. I have a rule. If I am to eat something, I can't participate in the killing and butchering. It's a little too personal for me. To where as Jason LOVES the entire process. Its rewarding to him that something he killed, butchered, and smoked tastes so delicious. I think it may taste extra delicious to him because of all of the effort he put into the process. "A little to left, Honey." "Or right. Perfect! I can see the guts now!" Now my baby is all up in the pig's business. "Time to get ready for school, KK." "Mommy, did you see his eyes were open?" I think she is still yawning in this one. Bless her heart. Now she has to come inside and eat breakfast. Ewww! 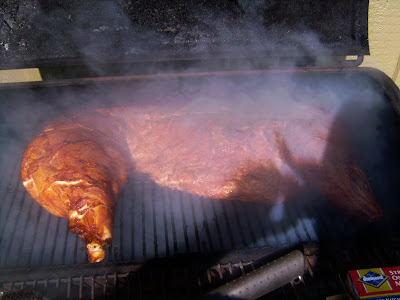 And Jason snapped a photo of the hog smoking. You can't really see in the photo, but there was no head present when smoking or eating. Who do you think we are, people??? Yuck! It was just side of the hog and was seriously delicious. Some of the best smoked pork that I've ever had!